This Simple touch Outlet is lightweight, convenient and easy to use. It was designed to increase safety, peace of mind and convenience in every room of your house. Plug your devices into the Simple Touch 30-minute and multi-setting timers and control how long they stay on with the press of a single button. Plug you flat iron or curling iron into the Simple Touch 30-minute timer for a safer way to do your hair. Use the Simple Touch Multi-Setting Timer for a variety of household devices including holiday lights, night lights, slow cooker, hot glues gun, coffee makers, coffee cup warmers, crafting tools, towel warmers, Panini press and other household appliances. The Multi-Setting Timer is also great for preventing your phone and laptop from over-charging. 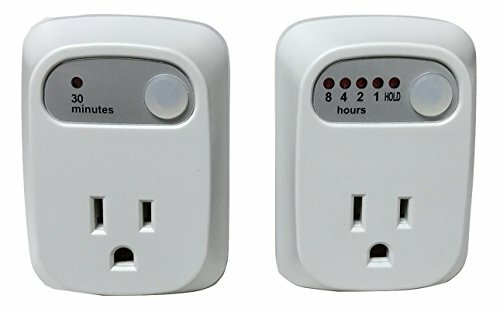 Both timers are high-quality and UL safety approved. Money saving plug-in timer can substantially reduce energy costs. Have Peace of Mind knowing that your devices will automatically shut-off on. UL Approved. Works great in your home, kitchen, dorm, hair salon, and workshop. If you have any questions about this product by Simple Touch, contact us by completing and submitting the form below. If you are looking for a specif part number, please include it with your message.